Early reports have started coming in that Robert Downey Junior may have joined the cast of Ubisoft's Assassin's Creed movie as a character that fans of the video game series are already very familiar with - Leonardo Da Vinci. Wait, what? Originally reported by Moviepilot and since removed, Downey Jr. has apparently been cast as inventor, artist and all-round genius Leonardo Da Vinci. 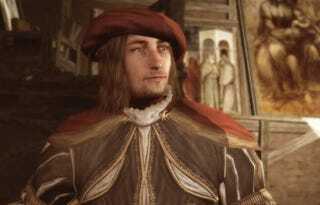 Da Vinci makes several appearances in the Assassin's Creed games, particularly the set of spin-offs associated with Assassin's Creed II, set in Renaissance Italy. Da Vinci becomes a close ally of the game's protagonist, Ezio Auditore, designing new weapons and technology for the Assassin as he fights his Templar foes. If true, it's an unexpected but perhaps in hindsight unsurprising move for the movie - many expected the movie, which stars Michael Fassbender as the protagonist Desmond Miles, to be based on the first game in the series, which was set largely in Jerusalem during the Crusades. However the casting of Leonardo Da Vinci would mean a move to the second game's setting of Renaissance Italy - and that Fassbender may also be playing the Assassin Ezio Auditore rather than Altaïr Ibn-La'Ahad, the first game's protagonist. It makes sense for Ubisoft, as Ezio and his associated games are by far the most popular elements of the franchise as a whole. Plus, the idea of Robert Downey Jr. and Michael Fassbender teaming up as Assassin-bros is pretty damn exciting. Assassin's Creed is due for release in May of next year - we'll keep this post updated if Ubisoft confirm or deny the reports.